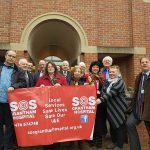 SOS Grantham Hospital (SOSGH) is a cross-party campaign organisation whose members all value the provision of local NHS hospital services. We have been fighting for Grantham Hospital acute services for over a decade. Before then community members, including the late Councillor John Hurst, campaigned to keep our hospital. We first campaigned against the Primary Care Trust (PCT) plans to close our Maternity Unit and downgrade our A&E unit. A petition of over 25,000 signatures was collated and taken to Downing Street on coaches organised by SOS founder members. Shortly after Grantham Hospital Defence Committee was formed. The PCT listened to us and decided to keep the Maternity Unit and A&E open. SOSGH have been campaigning ever since responding to a series of threats in an ever more challenging environment. Without this work we would have neither a local hospital nor an A&E unit today. We argue that United Lincolnshire Hospitals Trust (ULHT) is implementing Government strategy to centralise A&E services to the detriment of our rural community. Whilst ULHT argued that the closure of Grantham A&E was for ‘safety reasons’, we argue the night closure of our A&E has made emergency services less safe for local people. SOSGH members have established a network of media contacts due to over a decade of campaigning on behalf of our hospital that we work with to promote our campaign locally, regionally and nationally. SOSGH members are resolved to continue fighting for our hospital and our hospital services. SOSGH members work with like-minded individuals and groups locally and nationally fighting to protect our vital NHS services. 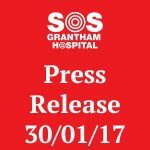 SOSGH started a petition in May2016 to oppose the downgrade of Grantham Hospital Accident & Emergency, which has now received over 40,000 signatures. Our communities have been working tirelessly to collect and collate the signatures on the paper petition forms. The petition is ongoing up and until the Public Announcement of the Sustainability and Transformation Plan (STP) after which we are handing the petition to 10 Downing Street. A Strategic Plan to oppose the closure through legal means (where appropriate) and through campaigning/lobbying would be necessary. A Short Term and Long Term approach would be required. Although there are issues relating to United Lincoln Health Trust (ULHT) there are also issues regarding Government Policy – especially the centralisation of A&E units nationally that are affecting our local services, particularly in rural areas. Any legal costs – We are currently waiting to be billed by Leigh Day solicitors for the Stage 1 of the Judicial Review process. Necessary campaign costs – To date thanks to kind donations zero funds have been used by SOS Grantham Hospital for campaign costs. Please note ONLY people authorised by us may collect funds our behalf. It was also agreed that in the event funds were not used that they would be donated for charitable use after further public consultation. An SOSGH bank account has been set up with the kind assistance of Yorkshire Bank (Grantham Branch) where donations are held. A breakdown of all donations received by SOSGH will be available on this website. SOSGH provided background support for the Fighting4 Protest March on 3 September. SOSGH worked with Leigh Day solicitors to identify the possibility of progressing a Judicial Review. The first stage of this process was completed. The response which came back led Leigh Day to advise that because the unit was closed for ‘safety reasons’ it would not be appropriate to progress with a Judicial Review which at best would result in a Consultation. An analysis of the material presented by ULHT and subsequent public statements by ULHT exec board members has raised a number of other questions that have led to our ongoing work. A summary Strategic document was produced and shared publicly highlighting the main issues identified. In particular ULHT appear to be downplaying the vital lifesaving resuscitation role of Grantham Hospital A&E. SOSGH proposed holding a vigil outside the hospital every Wednesday. Thanks to everyone in our community for their ongoing support. SOSGH members were active in lobbying and debating at both South Kesteven District Council (SKDC) and Lincolnshire County Council (LCC). We received unanimous support from both councils who almost unprecedented voted unanimously to call for Grantham Hospital A&E to be reopened and Lincolnshire County Councillors called for our county to retain 3 Accident & Emergency Units due to its size. Grantham Mayoress Cllr Linda Wootten and the Grantham Charter Trustees also gave their support to our campaign. Especial thanks go to Councillors Ray Wootten and Charmaine Morgan for their efforts. SOSGH have written to and met members of ULHT board and Nick Boles MP to put key concerns. 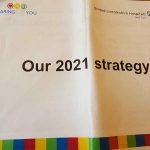 SOSGH have raised questions at the NHS England AGM regarding strategic plans to centralise A&E services and ‘reduce demand’ to our Emergency Ambulance service. SOSGH are monitoring the LCC Health Scrutiny Committee, speaking and providing evidence to the committee. SOSGH are working in confidence to collate vital evidence toward their case for the Parliamentary & Health Services Ombudsman. SOSGH is working in confidence with health staff and legal representatives to write the case for the Misconduct in Public Office to be submitted to the Police and the Crown Prosecution Service (CPS) if deemed appropriate considering the strength of evidence available. SOSGH members are scrutinizing the STPs and will take campaign action accordingly. SOSGH have launched our website sosgranthamhospital.org.uk with direct links to the Facebook page and Twitter feed as we are encouraging people from the wider community to join us for regular campaign updates. SOSGH has organised a protest march on 29 October 2016, as announced at the rally on 14th August, and liaised with the Police, the LCC Highway Department and the District Council and First Aid suppliers. Thanks to Fighting4Grantham Hospital Facebook group for helping to promote the march. SOSGH members are submitting the Stop ULHT downgrading Grantham Hospital A&E Petition to Downing Street once the Sustainability and Transformation Plans (STPs) are released publicly. Vigils – Join our vigils outside Grantham Hospital every Wednesday evening from 6pm-9pm at Grantham Hospital entrance. Thanks to everyone who has supported these – especially Lunch Box who have so kindly donated hot drinks and nibbles. Petition – We are calling upon ULHT and Rt. Hon Jeremy Hunt MP Minister for Health to stop the downgrade of Grantham Hospital A&E. The petition will be ongoing until the Lincolnshire Strategic Plans have been publicised. Have you signed our petition yet? If not you can do so online or download a form from the Petition page. Have you visited Grantham Hospital A&E prior to the closure at nighttime this year? Have you or anyone you know had to go to another A&E unit since the night time closure of Grantham Hospital A&E this August? Have you required East Midlands Ambulance Service (EMAS) since the nighttime closure? What was your experience? Did you suffer unduly as a result of the changes imposed to our A&E? Would you like help making a formal complaint? 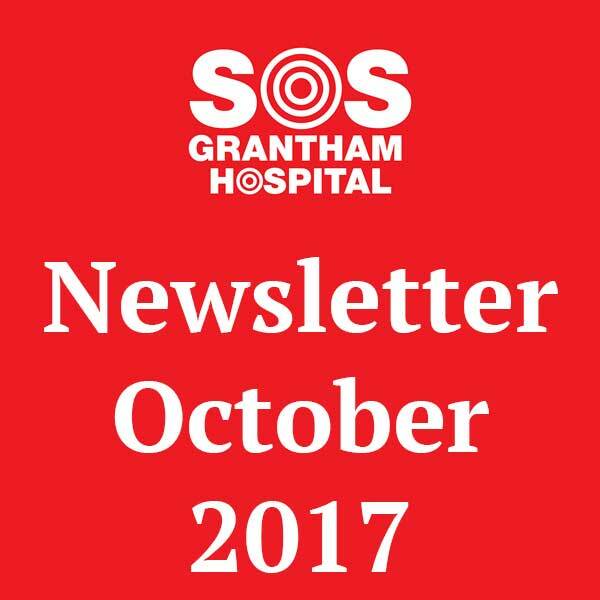 Will you support the SOS Grantham Hospital campaign? Write to Lincolnshire County Council Health Scrutiny Committee members? 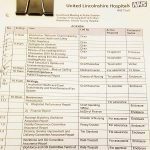 Write to ULHT board – Executive and Non-executive members? Write to SW Lincolnshire Clinical Commissioning Group? Write to Jeremy Hunt MP – Health Minister? You may write to any of the above parties directly or c/o SOS Grantham Hospital, 45 Harrowby Road, Grantham, Lincolnshire NG31 9ED expressing your concerns. We will collate your letters and forward them on your behalf. Our member Debbie Grinnell would love to hear from you. Your letters and drawings are also welcome (with parent/guardian approval of course!) Write to Debbie at SOSGH, 45 Harrowby Road, Grantham, Lincolnshire NG31 9ED and we will take your work to Downing Street too!